Businesses rely on a number of technology solutions to ensure that their day-to-day operations perform efficiently and effectively. As we become more digitalised, it has become a standard for businesses to make the switch from traditional phone systems to (VoIP) Voice over Internet Protocol, in line with modern workspaces. Although customer leads will also come directly from online platforms, we cannot ignore voice communication, as phone lines are still a major artery from customers to businesses. With this in mind, it is important that you have the correct phone system in place that will fit your business and its processes. 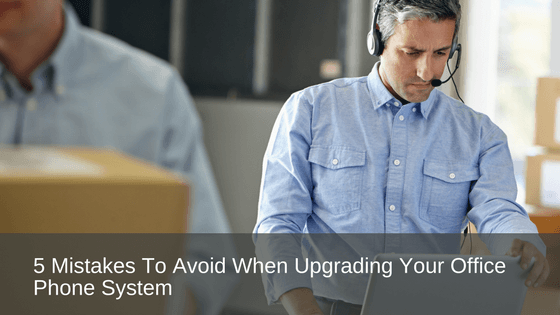 Before you consider upgrading your office phone system there are some key considerations. First of all, what is VoIP? VoIP stands for Voice over Internet Protocol. It is an alternative way of making phone calls by using internet broadband rather than the conventional analog phone system. It has a lot of advantages over the traditional phone system such as lower costs, good call management features, flexibility and the ability to handle various media types. The right system will present your business as current, professional, reputable and accessible. Besides all the techy features a VoIP system offers, it can also improve the overall efficiency of your business, therefore choosing the right business phone system is imperative to your company’s bottom line. Here are a few mistakes to “avoid” when choosing a new VoIP system for your business. In this day and age, we all operate with a great sense of urgency, both in business and social aspects. We live in the age of instant gratification whether we’re purchasing something online or wanting a problem solved without delay. But from a business perspective, taking the time to do your research and making an informed decision is crucial. Planning ahead will help you in the long run. If you are coming to the end of your contract with your current provider, give yourself at least six months to explore new options and different phone systems so you can find the right fit for your customers and your business needs. The right VoIP system will support your company’s reputation, branding and customer service strategy. Make sure you have the right internet plan in place for your business. A reliable internet connection is critical, in order to support your voice service and to ensure that you will have a strong, reliable connection when you are at your desk (especially if your business utilises cloud-based services). Voice systems require substantial bandwidth so ideally, an uncontended broadband service will be the best option. This means the line connection to the internet is purely reserved for your business and you won’t have to worry about slow speeds or bad connections as you would when sharing a line with the rest of the businesses on your street. Having a good internet connection also minimises voice distortion and potential dropouts. It seems too easy to just go with a polished, glossy product that claims to offer a one-size-fits-all package. As a business, you need to be wary of what exactly is offered – software-wise, is the application a combination of software/data/CRM, or is it voice-only? What is required from a backend perspective and will you have to make changes to your internal business resources? Will there be a lot of customising and tailoring required to get the software to match your business needs? Another consideration is the possibility of outages that may occur with providers. These are all things to consider when looking at your VoIP options. Bespoke VoIP applications should be taken into consideration when choosing a phone system, as they are designed for voice-only, are tailor-made specifically for your business and tend to be stronger and more reliable. Another question to consider is, will your business eventually expand? Will the phone system allow you to increase the lines or condense as needed without major interruptions? Will your business be relocating in the future? Is the VoIP system fully mobile and will your business lines be affected by any transitions? It’s good business practice to take the time to do the research, assess the risks and evaluate your options when considering a new VoIP telephone system. Remember that not every system will fit your business and its business processes. We highly recommend you make time for the correct due diligence process when comparing phone systems to ensure that the system you choose will meet your business needs, is reliable and efficient and will grow with you and your business into the future.